Surah al Fatihah is described as the ‘Mother of the Qur’an’ and the ‘Seven oft-repeated verses’. It is recited in every unit of every prayer. It is one of the chapters of the Qur’an that we memorised as children and one of the chapters that we will teach to our children. Each and every one of the 114 chapters of the Qur’an has a single theme and subject. Every topic within that chapter will then relate to that single theme. 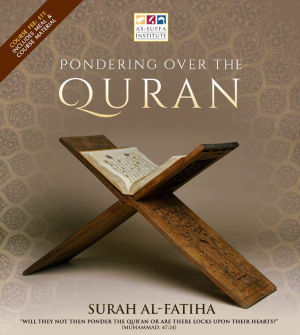 The beauty and message of Surah al-Fatiha is the comprehensive summary of the message of the Qur’an. Each and every time we recite Surah al-Fatiha, whether in or out of the prayer, it should be a reminder of the core principles of Islam, for which the Qur’an was revealed and the Prophet Muhammad (peace and blessings of Allah be upon him) was sent.